These passive solar home plans reflect my effort to create a simple, cost effective way for people to build beautiful, easy living, low maintenance, living spaces that are synchronized with the seasonal movement between the earth and sun. 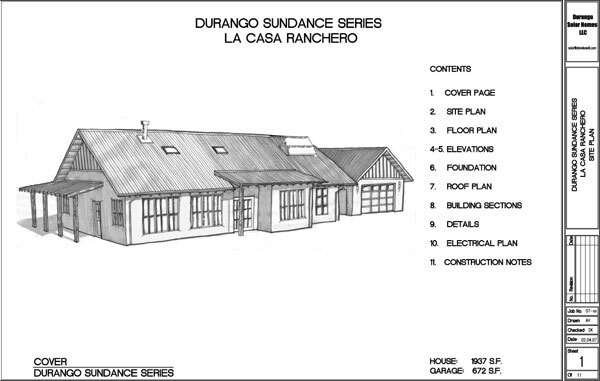 The architectural style is reminiscent of the historical ranch homes of the rural West. The basic traditional architecture has been updated to create functional living spaces that reflect the principles of modern passive solar design. The homes are intended to be constructed with a total green building program. The program includes using resources efficiently, high levels of insulation, energy efficient boilers and appliances, low toxic and recycled materials. Appropriate landscaping and low water use drip irrigation. The primary focus in this green design program is the use of passive solar features and an optional active solar element. With proper solar orientation, these home designs will automatically create warm sun bathed winter spaces and cool shaded rooms during the summer months. The ideal ratio of south facing glass to floor area, as well as thermal mass and roof overhangs, has been calculated into the design. The thermal mass wall that runs through the center of the living space and the concrete slab floor store solar heat during sunny winter days and slowly release it back once the sun has set. The floor and wall thermal mass can also be cooled with night air during the summer months greatly reducing the indoor daytime temperature. My favorite material for constructing the mass wall with is adobe blocks; 10" x 14" x 4" earthen bricks, each course of adobes lay in a bed of clay and sand mortar. The mass wall could just as easily be constructed out of concrete blocks, brick or stone for a different look. Patios and covered porch areas are integrated into floor plans to extend the living spaces into the great out of doors. The outdoor living spaces are located on different facades of the house creating comfortable use at different times of the day or season. A sunny or shady patio is only a step away. Storage is another important feature of these designs. Numerous closets are located around the home as well as built-in utility shelving and a kitchen pantry. A large storage area in the attic is accessed by a pull down ladder in the utility room. Please contact me with any specific questions you may have on the construction of these simple solar homes. I am available on a consulting basis to guide builders or owner builders in the construction of these plans. The following text gives a brief explanation of the specific building techniques incorporated into these designs.